Brief Description: It has been a long-held belief for many that we, as human beings, are made for more, and so too is our world. Many are seeking some form of spiritual fulfilment – answers that can transform lives, attitudes and societies – but quite often reject the Christian Church and traditional religious institutions as irrelevant and backward looking. Thinking from the Edge presents a critical and imaginative exploration of religion - especially Christian, religious beliefs and faith within the context of ‘plurality’ – religious, cultural, historical and personal. It raises topical public issues around the faults, dangers and pretensions of religion, as well as the responsibilities and joys of religious belief. Written from a refreshing and inspiring perspective, Thinking from the Edge advocates a more adventurous, open and visionary approach to Christian faith and life that is applicable to and can nurture, embrace and celebrate the multiplicity of differences and human dramas that make up today’s Global Village society. About the Author: Alan R. Gawith was born in 1924 into a Quaker family and attended a Quaker school. During the Second World War, he served with the Friends’ Ambulance Unit in London, Holland and Germany. This background has remained a strong influence on his life, study and work. He was ordained a priest in the Church of England in 1957, and worked as a Social Responsibility Officer for Manchester Diocese from 1974 to 1989 and as an HIV and AIDS Adviser between 1988 and 1992. A useful tool to aid new thinkers and modest debaters. Some texts are inherently difficult to review and this is one of them. Alan Gawith writes from the heart and from the depth of his personal and professional experience as a parish priest in the Diocese of Manchester and as Social Responsibility Officer for a considerable period of that time. 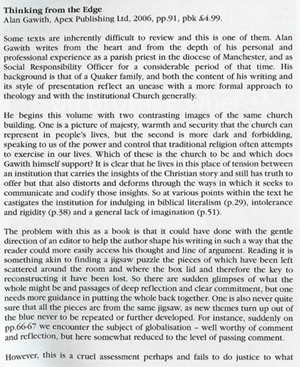 His background is that of a Quaker family and both the content of his writing and its style of presentation reflect an unease with a more formal approach to theology and with the institutional church generally. He begins this volume with two contrasting images of the same church building. One is a picture of majesty, warmth and security that the church can represent in people’s lives, but the second is more dark and forbidding, speaking to us of the power and control that traditional religion often attempts to exercise in our lives. Which of these is the church to be and which does Gawith himself support? It is clear that he lives in this place of tension between an institution that carries the insights of the Christian story and still has truth to offer but that also distorts and deforms through the ways in which it seeks to communicate and codify those insights. He is saying that the church as institution does still have things of value to say to the world but that it needs to “loosen up” and stop taking itself and its “beliefs” so seriously. “We shall need to find new ways of showing God’s relevance to culture and society and to the need for change. We shall need to find new ways of speaking about the ‘truth of God’ that do not depend upon arguments about the ‘existence of God’ (P41). “We need to be more radical and to say clearly that all religion is a human and social construction. But then we need to go on to say that nevertheless all religion seems to be based upon, or to arise from, some genuine human sense that ‘there is more’” (P49). In order to do this the church needs to develop a Ministry of Imagination (P51). One is tempted to say – and perhaps this is not so far from the spirit of the text – the church needs to develop a Ministry of Silly Walks! 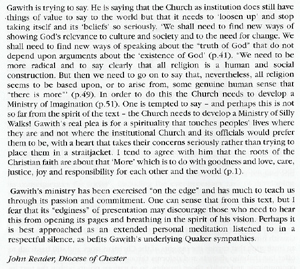 Gawith’s real plea is for a spirituality that touches peoples’ lives where they are and not where the institutional church and its officials would prefer them to be, with a heart that takes their concerns seriously rather than trying to place them in a straitjacket. I tend to agree with him that the roots of the Christian faith are about that “More” which is to do with goodness and love, care, justice, joy and responsibility for each other and the world (P1). Gawith’s ministry has been exercised “on the edge” and has much to teach us through its passion and commitment. One can sense that from this text, but I fear that its “edginess” of presentation may discourage those who need to hear this from opening its pages and breathing in the spirit of his vision. Perhaps it is best approached as an extended personal meditation listened to in a respectful silence as befits Gawith’s underlying Quaker sympathies. 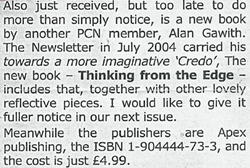 THINKING FROM THE EDGE is written from the edge by an octogenarian who has braved that edge all his life, from his time as a conshie Quaker ambulance officer in the concentration camps at the end of the War, to his ministry in the Church of England. It represents the strand in Christian theology which unites Tielhard de Chardin with Leonardo Boff and the Anglican Ubuntu ethic of Desmond Tutu, at the same time drawing on the religious epistemology of Karen Armstrong to assert that blind and literalistic ( fundamental) belief must give way to a better story, a story in which we all take responsibility for our parts in the telling. The kind of belief that is formulated as an unchanging creed whose statement defines the denomination of the utterer is a closing of the mind , a shrivelling upon itself and a spiky defence from the challenges of a changing world - a hedgehog. Such an attitude results in the absurdities of certain readings of Bible passages ( eg particularly parts of Leviticus and the Pauline epistles ) leading to blatant sexism and homophobia. Rather, this couragaeous cleric speaks from the pulpit on the edge of faith in the guise of a fox: far from a "God-shaped hole" in our genetically determined cognitive apparatus set there by some narcissistic Intelligent Designer, our human longing for meaning is like the vacuum of a Big Bang drawing in knowledge and experience, learning ,trusting, cooperating and learning more, so that the understanding of God that we create is ever-expanding - growing eternally in that infinity of compassion, that finds different names in the different faiths, and no name at all in Buddhism. In my view a vicar who takes Luke 4 :17-21 as a "mission statement" quoting it three times in a book of only 90 odd pages has got the priorities right. Alan Gawith has certainly done that. Like a Muslim he believes that diversity is a sign of the bounty of Allah; like a Rasta he reasons that Jah is manifest in warm flesh and blood; like a Shaker or a whirling dervish he is off with the Lord of the Dance, and like a New Ager he thinks this metaphor of the dancing deity may just as well be female. I think there are a lot of people who are going to read this book and want to give its brave author a great big loving hug. RETIRED clergyman the Rev Canon Alan Gawith has published a new thought provoking book. “Thinking From the Edge” is the latest work from the Leigh-based honorary Canon of Manchester Cathedral and former social responsibility officer for the Manchester diocese and HIV/Aids adviser - who is now closed involved with the well being of asylum seekers and refugees coming to the area. Mr Gawith was born in 1924 into a Quaker family and attended a Quaker school. During WW2 he served with the Friends Ambulance Unit in London, Holland and Germany and this background has remained a strong influence on his life, study and work. He was ordained in the Church of England in 1957 and moved to Leigh in 1974 with his wife, Kit. Of his latest book he says: “It has been a long-held belief for many that we, as human beings, are made for more, and so too is our world. Many are seeking some form of spiritual fulfilment - answers that can transform lives, attitudes and societies, but quite often reject the Christian church and traditional religious institutions as irrelevant and backward looking. “Thinking From the Edge” presents a critical and imaginative exploration of religion, and raises topical issues around the faults, dangers and pretensions of religion, as well as the responsibilities and joys of religious belief. Written from a refreshing and inspiring perspective it advocates a more adventurous, open and visionary approach to Christian faith and life that is applicable to and can nurture, embrace and celebrate the numerous differences and human dramas that make up today’s Global Village society. The book at £4.99 is available from Apex Publishing Ltd, call 01255 428500 for further details. I used to be a Christian, but now I follow a radically different spiritual path. After much soul-searching, I abandoned Christianity because it left me with too many unanswered questions. Thinking From the Edge left me facing afar deeper conundrum; what if it wasn’t Christianity that was wrong, but my perception of it? Gawith certainly isn’t shy of facing up to thorny issues. For example, he revisits the Biblical stance on homosexuality and interprets the proof-texts in a way that many orthodox theologians would balk at. 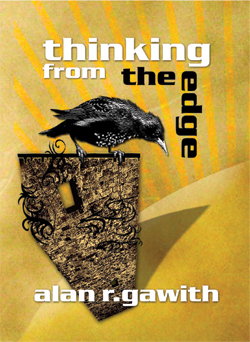 In Thinking From the Edge, the author opens up the whole field of Christian dogma and allows it to be passively invaded by a host of other influences. In doing this he draws the reader to an inevitable reappraisal of their religious convictions. Did it change my way of thinking, and make me want to return to the faith I abandoned? No; but it made me look at Christianity in a radically different light. If you’re interested only in reading what makes you feel comfortable, then the power of this little volume will be lost on you, but if you’re a serious seeker after truth, you shouldn’t miss it.